San Francisco, California – Thursday, January 21, 2016 – The California Historical Society opens The 1960s Revisited: A 50th Anniversary Celebration with the San Francisco premiere of its new exhibition, Experiments in Environment: The Halprin Workshops, 1966–1971, on Thursday, Jan. 21, 2016, at the California Historical Society (678 Mission Street, San Francisco). The exhibition continues through May 1, 2016. For detailed information regarding affiliated events please click here. General exhibition info can be viewed on experiments.californiahistoricalsociety.org/exhibition. Experiments in Environment: The Halprin Workshops, 1966–1971 brings the original documentation (photographs, films, drawings, performance scores) from the famed interdisciplinary workshops of landscape architect Lawrence Halprin (1916–2009) and postmodern dancer Anna Halprin‘s (born 1920) to San Francisco audiences 50 years after the first workshop. The exhibition is organized by the Graham Foundation for Advanced Studies in the Fine Arts and the Architectural Archives of the University of Pennsylvania. This San Francisco presentation also includes rarely-seen items from the Halprins’ personal archives and selections from CHS’s collections. The exhibition is made possible by generous donations from donors who have worked with Lawrence and Anna Halprin, including film director George Lucas, real estate pioneer Gerson Bakar, Lisa and Douglas Goldman Fund, John and Marcia Goldman, and the Walter and Elise Haas Fund. San Francisco, CA – Thursday, December 10, 2015 – The California Historical Society announces today a 3-Day Arts Festival, entitled The 1960s Revisited: A 50th Anniversary Celebration (January 21-23, 2016), featuring renowned scholars in conversation regarding the monumental cultural impact of several 1966 happenings. 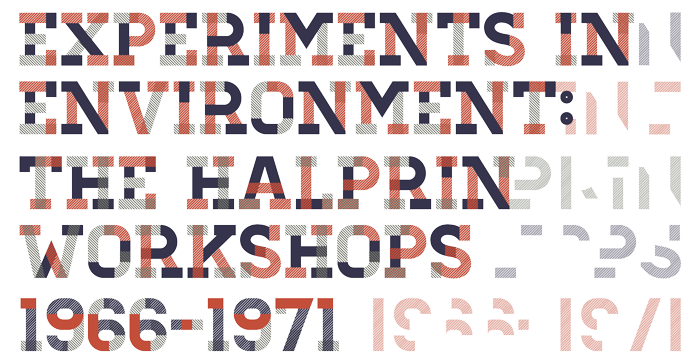 The centerpiece of the three-day festival is the opening of the new exhibition, Experiments in Environment: The Halprin Workshops, 1966 – 1971, on Thurs, Jan. 21, 2016 at the California Historical Society (678 Mission Street, San Francisco, 5 pm). The exhibition brings the original documentation of landscape architect Lawrence Halprin (1916-2009) and postmodern dancer Anna Halprin‘s (1920- ) famed interdisciplinary workshops to San Francisco audiences exactly 50 years after the first workshop in 1966. More than a quarter of the exhibit includes never-seen-before items from the Halprin’s personal archives; the selections for the San Francisco debut are additions to the traveling exhibit curated by the Graham Foundation for Advanced Studies in the Fine Arts and the Architectural Archives of the University of Pennsylvania. The San Francisco exhibition is made possible by generous donations from donors who have worked with Lawrence and Anna Halprin, including film director George Lucas, real estate pioneer Gerson Bakar, John and Marcia Goldman Foundation, Lisa and Douglas Goldman Foundation, and the Walter and Elise Haas Fund.